The 51st legislature of the Student Government Association (SGA) granted $9,727.50 in funding to student organizations Monday night. In total, groups requested $14,168.90, but SGA did not fully fund the requests because the legislature was trying to limit spending. SGA also voted unanimously to clarify the approval process for University-Wide Organizations (UWOs) and make changes to the Elections Code. Both bills passed unanimously. The bill to fund the Residence Hall Association (RHA) and Residence Life “First Year Farewell” event was in first readings and was not voted upon on Monday. In total, SGA considered nine bills, including one first readings, and passed all eight with amendments to some. Six of the bills requested funding from SGA. SGA Vice President of Finance Javi Reyes (18B) expressed concerns about SGA’s spending: the legislature currently has about $84,000 in its contingency account but cannot go below $53,000. The contingency account “funds University-wide programs or events that are sponsored either by the SGA or by organizations chartered under the SGA,” according to SGA’s Finance Code. The minimum is in place because the $50,000 covers overdraft protection from divisions and UWOs, and the $3,000 is a security fund, “which will pay for security at high-profile and/or controversial programs or events,” according to SGA’s Finance Code. Speaker of the Legislature and Senior Representative William Palmer (18C) echoed Reyes’ concerns about funding. “Even though it seems like we have all this money, we’ve actually been running down what we’ve built up over the years pretty quickly,” Palmer said. Suri President Isha Kumar (18C), Suri Vice President Kavya Sundaram (18B) and Suri Musical Director Tejal Pandharpurkar (18C) requested $740 to pay for registration and hotel room fees for the Awaazein 2018 A Cappella competition, the first national competition in which Suri is participating. The registration fee would “cover reduced hotel rates, care packages, photography/videography, venue fees, individual microphones and other costs for the Suri members,” according to Suri’s Bill 51sl50. College Council (CC) funded $325 toward Suri’s registration fees due to restrictions in their monetary policy. The competition is located in Dallas and 18 Suri members are set to perform. CC was unable to pay the hotel room fees because Suri received the total amount for the rooms after its CC hearing, Pandharpurkar said. Suri leadership said they did not know how much money they would receive from their Chipotle fundraiser, which was at the same time as the SGA meeting. Legislators unanimously passed an amendment to the bill that would fund up to $740 if Suri meets with CC again to request funding for the hotel fee cost and CC declines Suri’s request. The bill passed with nine votes. Bill 51sl51, proposed by Complex President Lori Steffel (21C), requested funding for Emory RHA and Residence Life’s “First Year Farewell” event “to celebrate the end of the Class of 2021’s first year,” according to the bill. Although the event is geared toward freshmen, Steffel said all Emory undergraduate students would be invited to attend the event, which is scheduled for April 20 on McDonough Field. Steffel added that she learned about the process of writing bills only recently and said that the bill is “not in a state of being able to be passed and funded,” but she wanted to present the event to SGA and see if SGA would be interested in funding the event. The bill was in first readings, and, therefore, is scheduled for a vote in the next meeting. Association of Caribbean Educators and Students (ACES) President Zariah Embry (20C) proposed Bill 51sl52, which would allocate $3,168.85 to purchase “student produced promotional video, vases, balloons, flameless LED candles, sand, plates, utensils, napkins, DJ, Capitol Police … chafing dishes, authentic Caribbean and Emory shuttles,” for ACES’s Island Delight event. ACES fundraised a total of $6,084 for the event: $5,676 from CC, $100 from the Department of Latin American and Caribbean Studies, $100 from Racial and Cultural Engagement (RACE), $125 from Spring Budget fundraising and $159 from a Caribbean tea sale. Junior Representative Madelyn Zapata (19C) proposed an amendment to lower the requested amount from $3,168.85 to $2,157.50. The amendment and bill passed unanimously. African Students Association (ASA) President Clementina Nyarko (18C) presented Bill 51sl46 for the third consecutive SGA meeting to fund ASA’s “Taste of Africa” event. Nyarko stated that 120 students from the Essence of Emory program, which invites recently admitted students who are first-generation or from underrepresented cultural and socioeconomic backgrounds to visit Emory, will be attending the event. The Taste of Africa event will be allowing 50 non-Emory students to attend and closing the event to Atlanta community members. ASA also received $2,000 from CC. Attorney General Elias Neibart (20C) recommended that SGA fund the event $3,000 because only half of the attendees would be Emory students, but Sophomore Representative Ngozi Ugboh (20C) recommended adjusting the amount to $4,000. Ugboh reminded legislators that ASA has exhausted all other spending resources and needs funding from SGA. Palmer informed legislators that the Finance Committee would not allow the bill to pass if student activity funds were not being spent only on Emory undergraduate students. Freshman Representative Austin Graham (21C) proposed an amendment to change the amount allocated from $6,059.30 to $3,030. The amendment passed, with Ugboh abstaining because she is a member of ASA. The bill passed unanimously. Bill 51sl54, proposed by SGA President Gurbani Singh (18B) and Oxford Continuee Muhammad Naveed (17Ox, 19C), would fund $3,000 for Spring Break 2018 airport shuttles. Singh said the bill was proposed late and wished there was a Campus Service committee who would handle shuttles. Spring break begins this Saturday for undergraduate students. The bill was passed with eight votes and one against. Palmer voted no. Singh and Graham proposed Bill 51sl56, which amends parts of the Elections Code to reflect updates to the voting system on OrgSync. The legislature passed it unanimously. In the Election Code’s Part III Article 1 about general elections, the bill added that Elections Board will send voting notifications to students between 1 to 12 hours before voting opens and should inform students of the voting periods threes day in advance. The bill also added a section that states that candidates have until three business days before voting period begins to drop out of the election. Each undergraduate division must determine voting form text for the final ballot one week before campaigning begins and email them to the platform organizer. The text must also be approved by the attorney general and elections chair. In case of unexpected technical difficulties with voting, SGA and the Elections Board will have a hearing to determine if the voting period should be extended. The bill removed section D in Part III Article 2 regarding general elections that stated that SGA will no longer keep a physical copy of the sample ballot in SGA offices. There will only be an electronic copy of the ballot. The bill removed the joint candidacy section of Elections Code Part IV Article 3 to reflect SGA’s Feb. 19 vote to prohibit joint candidacy in SGA elections. SGA’s joint session with Graduate Student Government Association (GSGA) was canceled because some GSGA legislators and executive board members were off-campus due to Goizueta Business School’s graduate spring break, and GSGA did not have quorum. The two legislatures were scheduled to vote on Bills 51sl53 and 51sl55, but they were proposed and voted on during SGA legislative meeting instead. Shannon Anderson (20C) and Sophomore Representative Johnna Gadomski (20C) proposed Bill 51sl53, which allocates $1,200 for shuttles to and from the March 24 March for Our Lives event at the Georgia State Capitol. Anderson stated that in the first 36 hours of creating a Facebook event page that would gauge Emory student’s interest in attending the march, about 100 students expressed interest in attending and using the shuttles. Only undergraduate students can use the shuttles that SGA funds. Gadomski amended the bill to fund $800, and the amendment and bill passed unanimously. Bill 51sl55, submitted by Singh and GSGA President Mark Neufeld (18B), clarified SGA and GSGA’s approval of UWOs. The bill states that UWOs must meet requirements of both the undergraduate-wide organization and graduate-wide organization, and the Joint Executive Council reviews and approves UWOs. 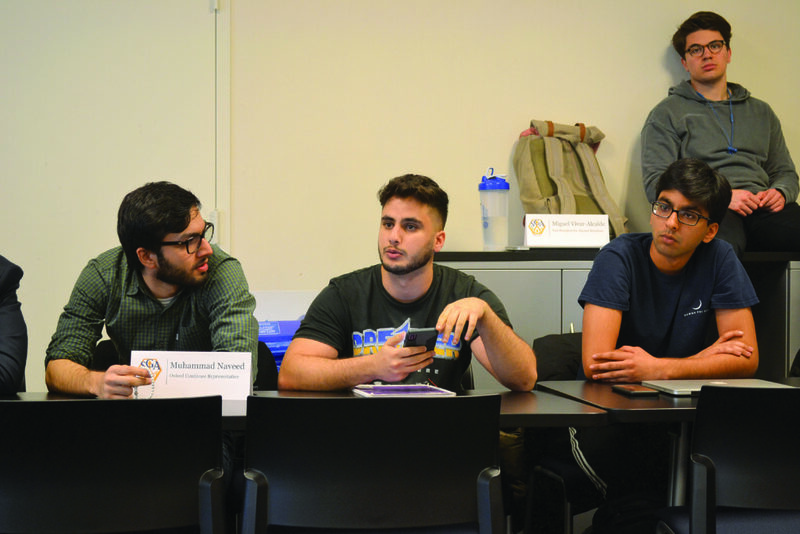 The Joint Executive Council, formerly known as the Joint Governance Council, is composed of executives from SGA and GSGA that convenes to address University-wide issues. The bill requires UWOs to submit a report to the Joint Executive Council annually that includes information about “their historical activities and use of the student activity fee … [and] their projected budgets,” according to the bill. The meeting lasted almost two hours, about an hour longer than scheduled.